The following content will guide you through the stages required to build an SMS Survey. It will also explain the different types of SMS Survey available. What is an answer label? Defining the next question when using branched surveys? Having logged into the SMS Surveys environment, select the ‘Create a new survey’ button on the left of the page, to access the ‘Survey Details’ area. Use the ‘Customer’ dropdown to select the customer name. Once you have done this a ‘Phone Number’ dropdown will appear where the survey account and Virtual Mobile Number can be defined. Define a Name for your survey E.g. Call Centre NPS. Add a description to identify what the survey relates to. 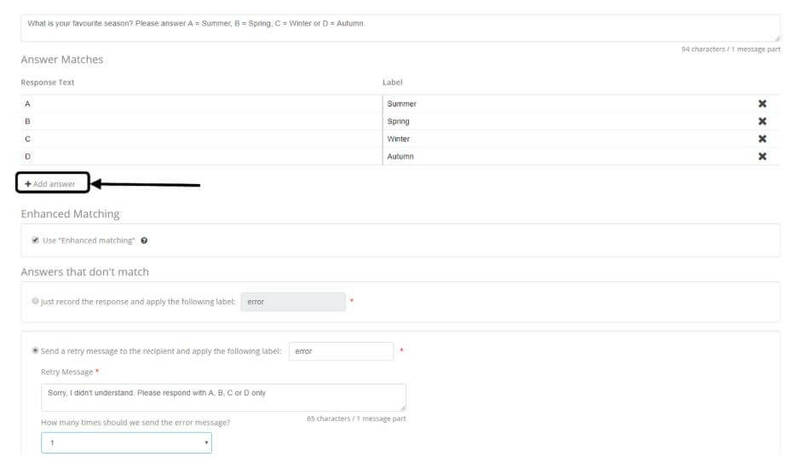 This option allows the sender to control the number of times of the same survey a recipient can receive within a given time period. E.g. If a customer had purchased an item from a business and was then asked for their feedback via SMS, a time period can be defined before they can receive the same survey again, even if the customer visited that business again on the same day. Always Allow –means that a person will receive a survey every time the survey is triggered for that mobile number. When you’re finished, click ‘Next’ to continue, or ‘Save for Later’ to finish at another time. 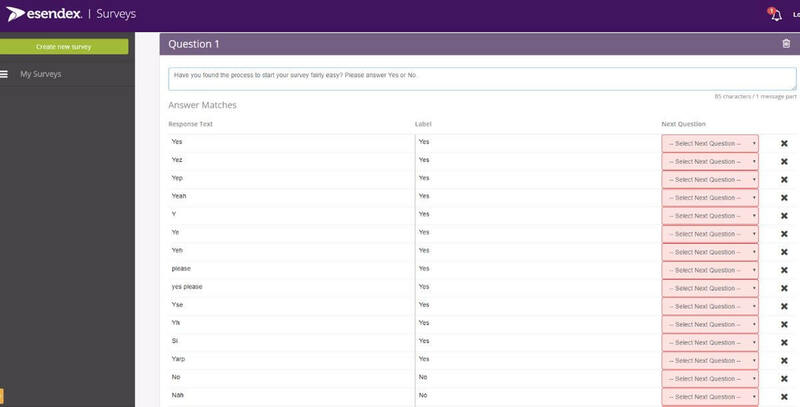 If you save for later, you will find your survey in the ‘draft’ section when you next log in. Linear surveys allow a set of questions to be sent chronologically, which is great for collecting data like personal information where the questions will always be the same. Branched surveys allow a hierarchy of questions to be set up, meaning that the question currently being asked is a consequence of the response to the previous one. This makes them perfect for gathering more specific information. E.g. if a potential house buyer has a specific requirement for a property, the follow on question could delve into more detail about that. Why include an opening message? Research has shown a greater response rate is achieved when you start your survey with an opening message – advising your recipient that a survey will follow. It is recommended to use a Branded Alias (Sender ID) to identify yourself rather than a Virtual Mobile Number. To include an Opening Message – click the switch ( ) to the right to activate. If on, the box will show green. Want to know how many characters/credits you are using? Check the tracker at the bottom right of your message box – this will break down the number of characters and credits the opening message (and for each question) will use. Click to add a new question, the below page will pop-up. If you have selected ‘No Template’ you will need to decide whether you want to leave the answer open or closed. 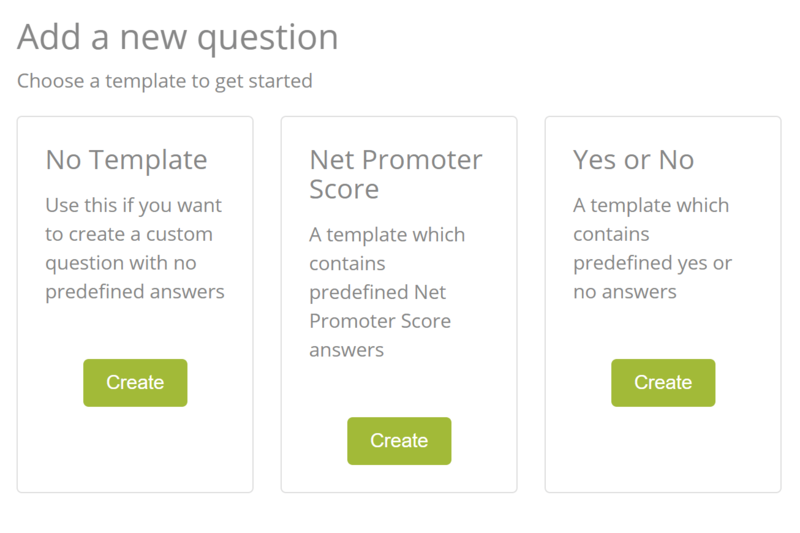 ‘NPS’ and ‘Yes or No’ questions are built to assist with commonly closed questions. Open questions allow for free text responses. Closed questions ask for specific answers. Example 2: How would you rate the level of service you have received – from 0 (extremely dissatisfactory) to 10 (extremely satisfied)? Please provide an answer from 0-10. It is important to include answer parameters within the question to ensure that customers respond appropriately. Creating an open question? Simply write your question and do not add any answer response text. Select ‘Just record the response and apply the following label’ as shown below. The label will appear in the reporting for your reference. Creating a closed question? You will need to write your question, specify the answer parameters and add the response texts with labels under ‘Answer Matches’. Labels are used within survey reporting allowing you to easily interpret your results. If the survey respondent answers the question and then adds additional comments, our system will recognise and record the answer provided and continue with the survey (by default this is switched on). To set the retry message text, click in the retry message box and write the response you would like to send back. You can select the amount of times the ‘error message’ will be sent if the respondent continues to provide answers that do not match (the default is 2). If your survey is branched (as in the example below) you will also need to select the question that follows based on the answer provided. You cannot completely do this until all questions have been added (if using a Linear survey, you will not see the Next Question column). You will need to map out every possible response text with the corresponding next question (the box will appear red if it is left vacant). Once you have completed adding your questions and answers, you can add a Closing message to thank your survey respondents. The Closing message follows the same process as the Opening message. Once you have completed the survey questions and answers, you can either choose ‘Save for Later’ or ‘Save and Start’. ‘Save for Later’ will keep your survey as a draft and allow for future editing. ‘Save and Start’ will make your survey ‘Active’, ready to send – once this option is selected you cannot make structural changes to the survey, you can only make minor adjustments to the questions. Please note, we always recommend you first send the survey to yourself/colleagues to test and ensure the structure and question sequence is correct.